In seventh pAsuram – AzhwAr says “To engage in all services we desire, we need not surrender unto thiruvEnkatamudaiyAn; thirumalai itself will bestow that”. Subsequently, AzhwAr says “the thirumalai where he resides will itself bestow the ultimate sAmyApaththi [equivalence to bhagavAn himself in eight qualities], as the result of surrender since it came up [in previous pAsuram]”. Seventh pAsuram. AzhwAr says “thirumalai itself will bestow the kainkaryam which was prayed for in the first pAsuram”. kainkaryam [carrying flowers, water, lamp, incense etc] is the result of prApthi [reaching parampadham]. nithyasUris along with their leader sEnai mudhaliyAr, with attachment, carrying the best flowers, good water, distinguished lamp and incense, being seated as ananyaprayOjana (one who is focussed exclusively in serving bhagavAn without any interest in worldly favours) bowed (which highlights their total dependence) towards very vast (the hill that causes emotional changes in sarvESvaran who is with SrI mahAlakshmi) thirumalai (divine hill) which is named thiruvEnkatam and felt accomplished (having realized their true nature). Such thirumalai would bestow us (who have taste in attaining the goal) the bliss of liberation which leads to parama sAmyApaththi (equivalence to bhagavAn in eight qualities). “vAnavar vAnavar kOnodum” is also explained as dhEvas along with brahmA [their leader] et al. sumandhu … – It can be explained as “mAmalar, nIr, sudar, dhUpam ivaRRaich chumandhu koNdu” (holding best flower, water, lamp and incense). Alternatively, it is explained as “mAmalar sumandhu, nIr sudar dhUpam koNdu” (holding best flower and having water, lamp and incense). Even if it is a karumugai (sampangi) flower [which is very light weight], due to desire/attachment of the devotees thinking “Hope he accepts it, hope he wears it, hope he blesses us specially”, it will feel very heavy [to emperumAn]. Alternatively, it feels heavy for sarvEsvaran because it was offered by one who is favourable towards him. Remember the incident of a prince offering sheNbaga (champak) flower to SrI purushOththamamudaiyAn (puri jagannAtha). purushOththama usually accepts champak flower with great satisfaction. Once, a few princes visited puri kshEthram. At that time, all the flowers except one were sold out. The princes out of pride, bid against each other and one prince won the flower for great expense [he traded his own kingdom for the flower with the flower vendor] and offered that flower to jagannAthan emperumAn. In the night, jagannAthan emperumAn appeared in the dream of that prince and mercifully told him “the flower you offered is very heavy and I cannot carry it”. amarndhu … – Explained in context of nithyasUris and sEnai mudhaliyAr. Also explained in context of dhEvas and brahmA. amarndhu – well seated. Though brahmA et al (dhEvas) are prayOjanAntharaparars (desirous of worldly pleasures), the nature of this divine hill is such that, it will even transform them to ananyaprayOjanar (those who exclusively desire for kainkaryam). Having such raw materials for their worship, they would bow in front of emperumAn and rise. AzhwAr considers them to have his own attitude which he highlighted in thiruvAimozhi 1.1.1 “thuyaraRu sudaradi thozhudhu ezhu” (worship his divine feet that will remove the sorrows and rise). nangatku – for us who are interested in kainkarayam. Explained as bestowing mOksham in the form of sAmyApaththi as explained in muNdaka upanishath 3.2 “brahma vEdha brahmaiva bhavathi” (one who know brahmam becomes like brahmam), muNdaka upanishath 3.1.3 “niranjana: paramam sAmyam upaithi” (having all blemishes eliminated through bramha vidhyA becomes fully equivalent (in eight qualities) to brahmam), SrI bhagavath gIthA 14.2 “mama sAdharmyamAgathA:” (those who have this knowledge, will acquire form etc that equals mine), periya thirumozhi 11.3.5 “thammaiyE okka aruL seyvar” (emperumAn will bless the devotee to become exactly like himself). Alternatively explained as bestowing the liberation that matches the true nature of the AthmA as said in chAndhOgya upanishath “svEnarUpENAbhinishpadhyathE” (the AthmA acquires a distinguished form matching his true nature and shines). Another explanation – thirumalai itself will bestow the result matching its own status. 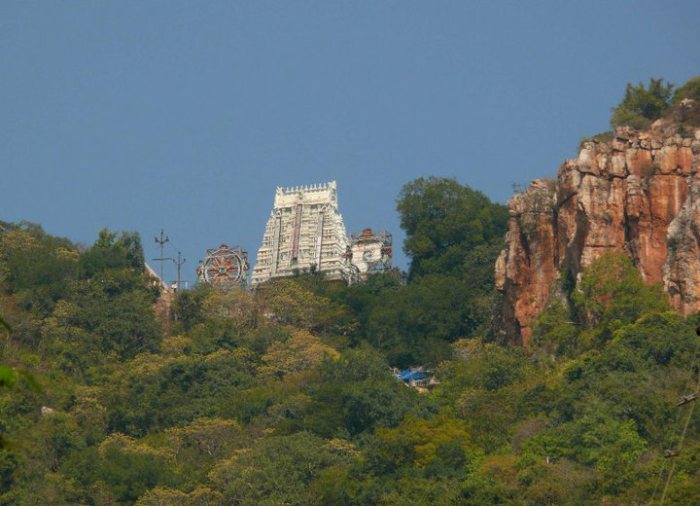 thirumalai AzhwAr (this divine hill) is fortunate in having thiruvEnkatamudaiyAn himself on its head. In the same manner, thirumalai AzhwAr himself will bestow such result as prayed by AzhwAr himself in thiruvAimozhi 2.9.1 “nin semmA pAdha paRputh thalai sErththu” (you place your fresh divine lotus feet on my head) as said in “thadam kunRamE tharum” (the hill itself will bestow). thadam kunRam – Having vast space so that thiruvEnkatamudaiyAn can roam around as much as he desires. nampiLLai explains SrI rAmAyaNam ayOdhyA kANdam 98.12 SlOkam to explain the vastness of thiruvEnkatam. kAkuthstha: – the reason is, SrI rAma who was born in the lineage of kakuthstha, the lineage that always seeks out secluded places for enjoyment, resided here happily (so it is gracious and comparable to thirumalai). kubEra iva nandhanE – Like kubEra would leave his palace and wander around pridefully in his gardens in the forests which are inhabited by dangerous beasts, SrI rAma was wandering around in chithrakUta forests leaving his palace in ayOdhyA. This entry was posted in thiruvAimozhi, thiruvAimozhi 3rd centum on August 8, 2016 by Sarathy Thothathri.